Whether you need a guard shack to protect industrial property or a larger unit to offer security for neighborhood homes, ordering your pre-fabricated unit online offers a variety of benefits you will have a hard time finding elsewhere. When you have to balance work life and personal time, sometimes saving even a few minutes or hours, makes a huge difference. If one small change could potentially save you days of extra work and reduced productivity at work, that small change should be worth considering. Shopping online isn’t just for Christmas gifts anymore. Panel Built provides a reliable online source for ordering prefabricated buildings and guard houses for your property. Save a lot of time, travel and manpower by choosing a pre-fabricated security structure online. Before you head out to a local contactor, check out companies that sell security booths online. When your order guard booths available online for sale, you can do so when it is convenient for you. Panel Built offers a variety of prebuilt guard houses with several additional features to ensure you get the unit that is perfect for your needs. If time is an issue, you can easily browse the Panel Built website on lunch or when your schedule lightens up. Panel Built includes photos of most of their products and product descriptions to help you choose the best security buildings for your property. When you opt to build a guard house on site there are several factors that could hinder work. Creating your guardhouse on site will impact the environment and could cause delays in work productivity or inconvenience for area residents. When adding in environmental impact, manpower used to build the structure and the time involved, ordering a prebuilt unit online is usually more cost effective. You can receive a free quote on your structure by visiting the Panel Built website and filling out a form with basic information about the type of structure you need. You can fill the form out in less than five minutes and receive a phone call with a price quote from a customer service agent without ever having to leave the office. 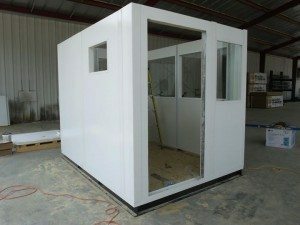 Because a Panel Built security booth comes prefabricated we are able to provide you with most of the different options available online. When you order online you will know what to expect when your new Panel Built guard booth arrives. 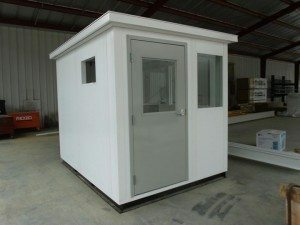 If you are looking for a simple guard house, Panel Built offers quick ship booths that are shipped within five days. These units come in five different sizes and features a diamond plate floor, a half-glass metal door with a flat roof and built in gutter. Save money and time by choosing a security structure online. Simply choose the right size and any additional features you want to include, place your order with one of our qualified customer service agents and wait for your building to arrive. Installation is easy. When you order a prebuilt security structure online you will reduce the amount of man power needed for assembling your new structure, maintaining production in the most important areas of your business. Additionally, ordering a prebuilt structure reduces the impact on your environment because the building is primarily assembled when it arrives on site. You don’t need to waste hours of your time selecting materials and building your own guard booth. Your security units should be high quality, safe and secure. When you order a guard house by Panel Built, you are guaranteed a high-quality building that will provide shelter and security to the individuals keeping your property safe. Panel Built structures are as stable as most buildings you would build on site and in some cases, more stable. Because your structure will travel preassembled, the buildings must be constructed to withstand the bumping and jostling associated with transport. This extra reinforcement ensures your security buildings are safe, secure and reliable. Running a reliable business, keeping a neighborhood safe and providing protection for your employees takes a lot of hard work and energy. Save more time and energy so you can focus on other tasks and choose a guard booth from Panel Built. For more information about prebuilt structures, visit Panel Built or contact a customer service agent.